You can often save bundles of money using Royal Mail Mailsort. More often than not the saving can actually pay for the packing costs! 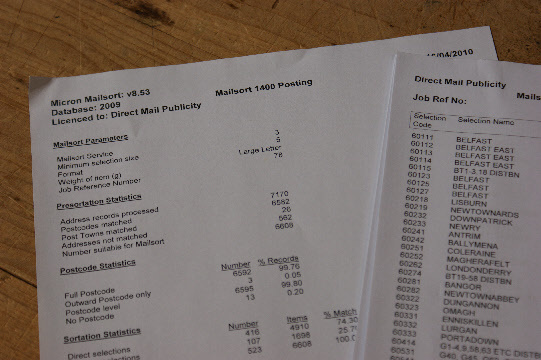 Mailsort processsing involves a computer sorting your mailing and presenting it bagged and labelled for delivery direct to its postcode destination. You get reduced rates from Royal Mail, up to 40% or more in some cases. There are certain conditions that must be met such as minimum posting quantities but these can be as low as 1000 for Large Letters or Packets. Don`t waste money; give us a ring today and find out if you can save money on your postage costs today by taking advantage of mailsort processing services.